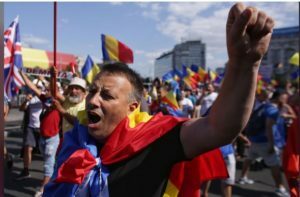 On August 10 eighty thousand people gathered in Bucharest’s Victoriei Square to protest the attempts of the Social-Democratic Party government to defuse the offensive of the powerful National Anti-corruption Directorate against PSD leaders. Many of the protesters were Romanians living abroad, who had returned especially for the occasion. The one thousand police and gendarmes who were deployed against the protest fired rounds of tear gas and eventually charged into the crowd, injuring 450 persons. International media reported on the violence and citizens’ outrage. Often mentioned were the extremely high rates of emigration, low wage levels in the country and anger at the perceived hindering of modernization and prosperity, in the shape of hospitals and highways, by the governing party, considered remnants of Communist elites. These articles reproduced the hegemonic blind spot in Romania’s political culture, assuming a correlation between the “rule of law” and rising living standards despite a total lack of evidence for any such connection. In line with this assumption, no one seemed surprised that Romanians were exclusively using the language of anti-corruption in order to articulate demands for redistribution. The dominance of corruption as key issue for post-socialist countries like Romania was left uninterrogated even by publications critical of liberal verities. For instance, on August 23, the US-based Jacobin Magazine published a surprisingly enthusiastic story about the Bucharest protests, submitted by a Romanian journalist who had attended the August 10 demonstrations. The article, titled “Voting with their feet”, reiterates the theme of emigration and suggests it was corruption that led people to leave. In the author’s opinion, the anti-government movement known as #rezist “relied on the fact that most of these Romanians experienced better lives in other countries, where there is less corruption and where they feel that states work better for citizens.” He explains that “connected to this is the prominent role the pro-European liberals play in the anticorruption movement, promoting the values of the European Union as an alternative to Romania’s chronic ills”. In the article and in the Square, PSD are called “the red plague”, a slogan of whose fascist origins most participants to protests are presumably unaware. These origins are nevertheless suggestive of the ideological resources shaping, more or less distantly, the latest protests. In a nutshell, #rezist is a right-wing populist movement. Its anti-corruption message is fundamentally a punitive law-and-order platform. It could be argued that the movement is broader than that, considering the other claims have become appended to it, including a claim to dignity and political belonging for those working abroad, and a demand for functional public services. But these demands are embedded within a neo-liberal anti-corruption discourse of a coherence and virulence that was unknown in the large-scale mobilizations of previous years. 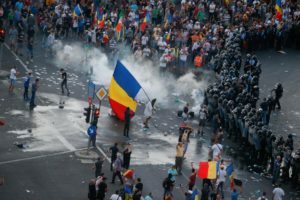 Certainly, all major protests in Romania in the past ten years have been ideologically checkered; but the most recent ones seem ideologically unsalvageable. employment of dirt-cheap seasonal farm workers, or the Minister of Economy’s proposal to eliminate the minimum wage (Romanian). In a country with a hyper-minimalist welfare state, where no one can actually survive on the dole (Romanian), the people marching for law and order and against corruption seem to have little sympathy for anyone “on welfare.” This lack of social solidarity, now the hallmark of politics in Eastern Europe, is the single greatest success of 25 years of free-market gospel in the region. In the face of all this, many in the local left appear to have maintained the position of reserved spectators. After all, the best-case scenario of these mobilizations would be the resignation of the government and the smooth resumption of the Anti-Corruption Directorate’s surveillance-heavy operations aimed at jailing “scroungers”, rich and poor. This left skepticism was no hindrance to pro-government media, which in the days after August 10th used a photograph of a protester wearing a t-shirt emblazoned with the word “antifascist” to conclude that dubious elements had provoked the gendarmes’ violence, in a quick nod to Fox News. George Soros and Soros-related conspiracies also got air-time on government-friendly television channels. Such increasingly frequent rhetorical lows in the media are cues that like the Hungarian Fidesz government, the Romanian PSD government is reaching for the traditional scape-goats of the extreme right. In Orban they may have found a despised but interesting role model, in Fox and Breitbart publishing inspiration. After all, the “workfare” the Romanian ruling coalition now supports was one of the great social protection ‘innovations’ of the Fidesz regime. But it is truly worrying that during the August 10th protests the police were ordered to shoot tear gas and advance on protesters. Such violence is largely unprecedented in the history of middle-class protests in Romania. (Of course, workers striking in the 1990s, the villagers protesting fracking plans in Pungesti, and the young people who got beat up for screening anti-NATO documentaries during the 2008 Bucharest NATO summit have quite different stories to tell.) But the large protests after 2011 have been largely safe, orderly affairs, with police preferring to “kettle” protesters rather than charge when things got rowdy. The protesters in Victoriei Square were dismayed that the gendarmes attacked. “Lefty Facebook,” on the other hand, was filled with four letters: ACAB, q.e.d. This is an increasingly authoritarian government, taking its cue from Orban and winking towards Erdogan. President Iohannis, who is loyal to the opposition, has condemned the violence. Despite suspicions of secret service involvement, it remains unclear which elements within the surveillance state did what – loyalties are divided, with some intelligence agencies loyal to the president and other to the government. The protesters may well eventually win and trigger the resignation of the current government, yet there is nothing on the opposition’s agenda which suggests that the employer-favoring changes made to the social assistance and insurance systems by the PSD might be rolled back. If they were to be cancelled, considering President Iohannis’ passion for free markets and expert-made policies, it could well be in order to make the implementation of the same principles smoother.